The shame of the Bugatti Veyron is about to end. Ferrari is going to recover the scepter of the fastest car on the planet. Something useless from a practical standpoint, obvious, but crucial to the brand image and a factory of dreams that is called Ferrari. So here is now ready for the heir to the Enzo, named for now with the code name "F150", a machine with a thankless task because wrest the scepter fastest car on the planet to a machine that makes the 410 km / h ( the Veyron Vitesse 1,200 hp with a maximum torque of 1,500 Nm and accelerates from 0 to 100 in 2.6 seconds) requires significant force also for Ferrari. Yet, at least on paper, the next superFerrari not afraid really competitors. Starting - of course - from the engine. Indeed engines: this Red will have three engines, a 12-cylinder naturally aspirated and an electric motor that will work just like the KERS in F1, giving performance even more incredible. "That is 10 percent less acceleration - explains the Ad Ferrari - Amedeo Felisa - and 40 percent less in terms of emissions." In detail, the Ferrari complex system works like this: there is a rear electric motor that assists the V12 station, while a second front electric motor only feeds power steering and air conditioning, thanks to a power converter. 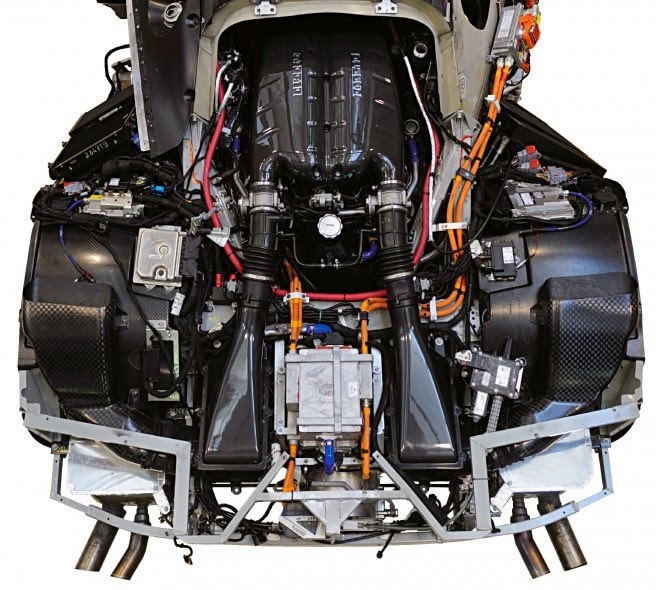 And to balance the best weight lithium ion batteries, are placed under the body. "We researched in great the best place to position these additional masses - says Felisa - so that had no effect negatively on the dynamics of the car." But the question is one: the F150 will walk even in 'electric mode'? Ie there will be a Ferrari hybrid that moves - even for a few meters - quiet as a ghost? Technically the system may of course do so, but this is a Ferrari ... "One of the main features - reveals fortunately Felisa - of our cars is the engine sound. Imagine that the system will provide a constant mixing of the two sources of power" . The 'voice' of Rosse is then saves. Kers apart but the wonders of this Ferrari does not end there. The shell is a monolithic piece of carbon fiber, made just like those of F1. But here are two places and there is space for many accessories inevitable on a road car. And also other materials have been tested since the end of the car is made of Kevlar and doors are in Carbon T1000. The result of all this technology is that the machine has a torsional rigidity 30% higher compared to similar cars. The cabin is then made to measure, with the pedals, steering wheel and seats made especially for the customer, just like in F1, while the aerodynamic flows were objects of advanced study to improve the load to high and low speed and to cool the better lateral radiators, ensuring the proper dose of air to the mighty V12 aspirated. Of course, this machine many things are still shrouded in total secrecy - from design to final power through the weight - but you're not wrong if you assume a cavalry of 1,000 hp, a weight of less than 1200 kg and the achievement of a weight / power record (that of the Enzo was 2.07 kg / hp ...). In short, the Veyron is advised.